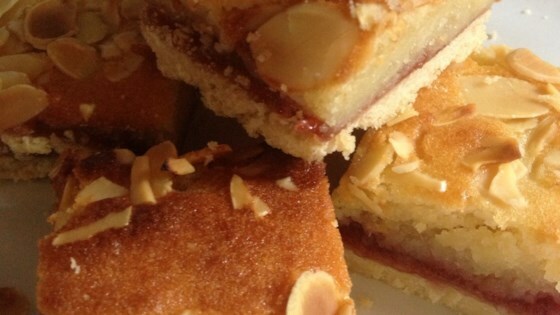 "A delectable version of the Bakewell tart baked on a baking sheet that is a favorite with everyone I know." Preheat oven to 375 degrees F (190 degrees C). Line a 8x12-inch rimmed baking pan with parchment paper. Roll out pastry dough thinly to fit the baking pan and press over the bottom. Cover with parchment paper and fill with dried beans for blind baking. Bake in the preheated oven for 15 minutes. Remove the parchment and beans from the baked pastry and bake until pastry has a golden color, about 5 minutes more. Set aside to cool, about 15 minutes. Spread raspberry jam evenly over the cooled pastry. Combine butter and 3/4 cup plus 2 tablespoons sugar in a large bowl; beat with an electric mixer until pale and fluffy. Add eggs one at a time, beating well after each addition. Add lemon juice, almond extract, and lemon zest and beat until well combined. Fold in ground almonds. Spoon almond filling over the raspberry base and smooth out top with the back of a spoon. Sprinkle sliced almonds over the top. Bake in the preheated oven until filling is golden on top and feels firm in the middle, 30 to 35 minutes. Cover pastry loosely with aluminum foil if it gets too brown. Remove from oven and allow to cool, about 30 minutes. Dust with confectioners' sugar before cutting into slices. Shortbread crust is topped with raspberry jam and a fluffy almond mixture .